Tomlinson, Bill. 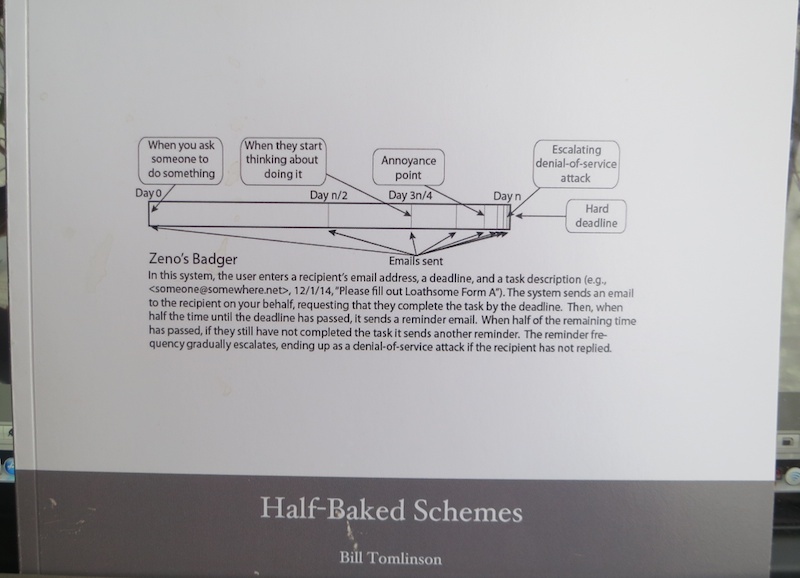 Half-Baked Schemes (Irvine, CA: Badger Books, 2015). Fig. 1, cover, with 'Zeno's Badger' half-baked scheme. It seems particularly apt to have a review of a book about half-baked schemes appear in the special issue of Hyperrhiz on Kits. The essence of kits is that they are half-baked, and ready for assembly and finishing by someone besides the designer. Once we start opening the hinges, though, the kit's meaning expands beyond "just for testing" to include the under-side of its promise and potential. Now, the kit begins to reveal under-done, and not thoroughly thought through, essential qualities: the links and pieces might be misaligned, the design not fully tested, the attempt raw, crude, and ill-digested. By definition, a kit is half-finished: assembly required. What once held a bright and shiny utopian promise begins to show its seams, and it might even seem silly and half-witted: signaling a "screw loose" (or missing) in both design and designer. The scheme sounds brilliant, or like a joke, or both; but, in any case, none of the intricacies of application have been fully thought through or applied in a complete and finished form. This is the context and situation of Bill Tomlinson's latest book: a pamphlet-sized limited edition of his own Half-Baked Schemes. It is half-baked in content and execution as only two copies were initially printed: one for the author's archive, and one for this reviewer; later a third copy was printed as a 50th anniversary gift for the author's parents, perhaps as a comment on marriage as always starting as a half-baked scheme, without consideration for the poor odds of success, and not proofed or proven as "solid gold" until five decades later. Tomlinson's half-baked execution (e.g., only printing 2 copies initially, and a third as an after-thought) has necessitated this review; for without this commentary and picking-up of the pieces, Tomlinson's brilliant, inspiring, silly, potentially dangerous, or even outrageous half-baked schemes would be just an experiment: never fully realized. One could imagine a print-on-demand edition, but then Tomlinson would have attempted a fully realized, and, therefore, less half-baked (with less possibilities for potential failure) project; and, as a finished project, it would also be much less interesting. The definition of half-baked schemes and kits inherently suggests the multiple, as one absolutely unique kit or plan without the expectation of many copies is not a kit, not even a beta-test, but merely a singular trial-run. The importance of these schemes and kits depends on the spread of iterations and later refinements, and these schemes do not spread because eventual builders rationally calculate the odds that the scheme or kit will actually work. Instead, kits and schemes work according to the context of discovery and the logic of invention; this logic, highlighted in what Gregory L. Ulmer (GLU) calls heuretics, works according to conductive appeal: it catches your attention as a joke, a Eureka moment, or some perverse combination of both. Without the glue, the kit may not hold together or take flight, and here we might insert an advertisement for Ulmer's Text Shop, where theory, praxis, and poesis join in the user-supplied experiments. It is that suggestive trace, the reserve power, or elastic potential of kits that sets off the conductive logic expressed in the receiver's question: "What could this lead to?" And, depending on the peculiar answer and associations, the kit/text-shop builder will interpret the kit-scheme-text as profoundly inspiring, a laughable joke, an outrageous provocation, or some assemblage that simulates the thrill of the Eureka moment before the realities and intricacies of applications deflate the context of discovery. It is that logic that leads me to suggest to the editor of this volume of Hyperrhiz to include a warning on the splash-page (a warning with a hyperlink to this merely supplemental book review: "Attempting To Build or Use These Kits or Schemes May Be Dangerous to Your Health. Please Refer To The Half-Baked Warranty Included Here"). In terms of the rhetoric of invention, there is an Emersonian suggestiveness in the half-baked scheme because in one "acorn" there is the potential for a thousand forests. As Emerson explains, "Epoch after epoch, camp, kingdom, empire, republic, democracy are merely the application" that grows from that one acorn (a half-baked acorn/scheme or memetic kit). (Emerson, 1847, Essays: First Series, reproduced at emersoncentral.com, n.p.) In that conception, the scheme unfolds its political dimension by suggesting how the singular scenario (private, peculiar, and potential) and visceral bodily actions reshape the political world in its repetitions, variations, and applications as it spreads through the public realm. 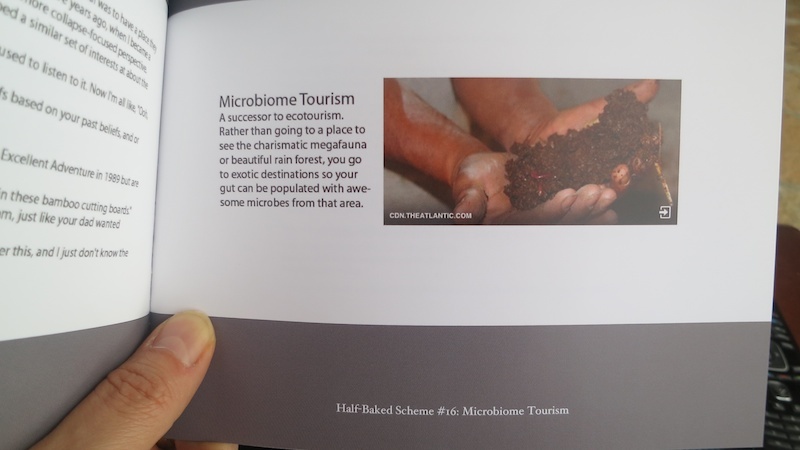 In "Microbiome Tourism," Tomlinson speculates, by analogy to eco-tourism and by allused to comparison with the grand tour of cultural sophistication and enlightenment, that one might travel to re-populate the microbiome with cultures to produce a sophisticated gut feeling, atmosphere, or visceral health. 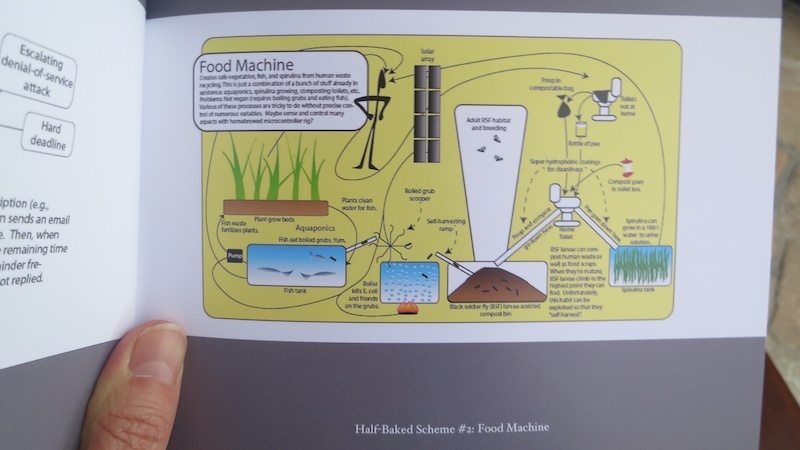 In "Food Machine," the scheme has the look of scientific and technical specifications and schemas. There are arrows indicating relationships among expertly drawn icons all demonstrating how one might use human waste as eventual fertilizer, and using mostly already-in-use processes and procedures. It seems plausible. When one looks more carefully, the automated "boiling of grubs" feed the fish (to which the scheme exclaims: "Yum"), which are in turn fertilizing plants, and eaten by the humans. The level of intricacy, the scatological underpinning, and the artificial ecological web of connections, re-imagined here, also converts the plausible into a potential user's fears about the half-digested issues piling up, and making an eventual stink, for whomever might try this one at home. Fig. 4, 3-D Printing Ultrasound. 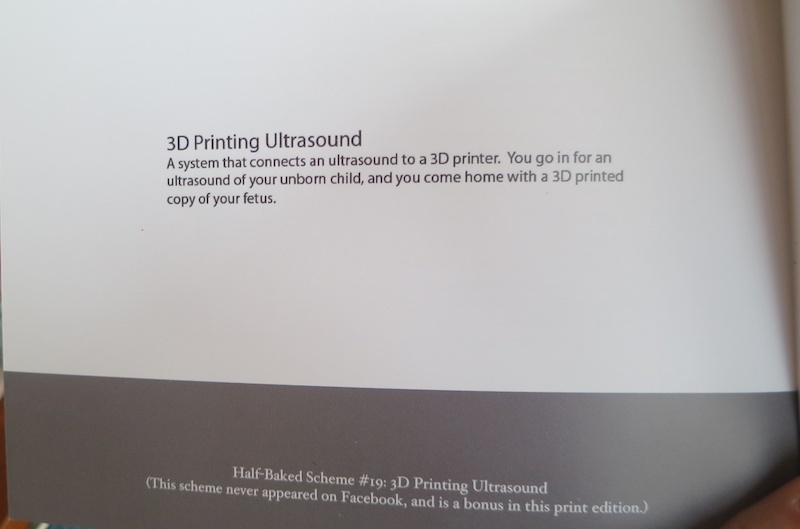 In "3-D Printing Ultrasound," Tomlinson once again makes a series of plausible claims mixed with schemes and processes already in-practice today (in this case, the printing of instant ultrasound photographic images of a fetus) to describe the reasonable-sounding scheme to 3-D print your fetus. When I read this ultra-sound scheme, I laughed aloud, shuddered at the political implications, and thought that I wouldn't be surprised for this to be available at the obstetrician any day now. I did not have these mutually exclusive thoughts and feelings one at a time, but all at the same instant with the image of the plastic 3-D printed fetus in someone's pocket after a check-up. Fig. 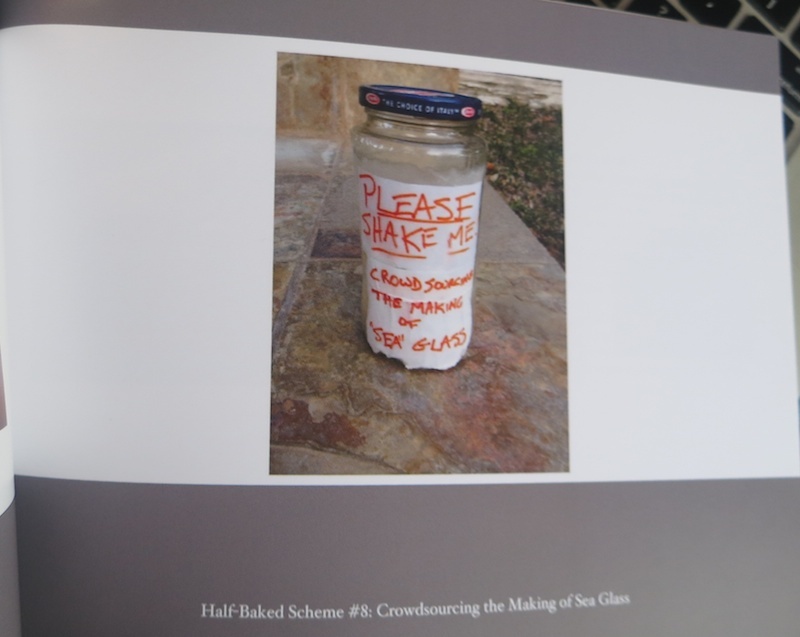 5, Crowdsourcing the Making of Sea Glass, back-cover. This final scheme, on the back-cover of the book, needs no explanation [or no caption is supplied], and leaves the audience to imagine the scenario that led to this scheme: the photograph suggesting a proto-type was designed and built, but the eventual results and data-set are not included. Of course, in nature, the repetitive shaking motion of ocean waves polishes the edges, and the shine off of, glass fragments; in this artificial and cultural testing of both "crowdsourcing" and a first-handshaking of the creation of sea glass, one imagines a passerby stopping to deliver a literal and figurative handshake: when one device sends a signal to another device to establish and open a line of communication or, in this case, the essential element of crowdsourcing in a performance of the handshaking. The proof of multiple handshakes would be in the later discovery of newly crowd-created sea-glass. Finally, figure 1, "Zeno's Badger," could serve as the motivation, in a mise-en-abyme, for the production of this special issue of Hyperrhiz on Kits. This particular half-baked scheme suggests an automated, and algorithmic, way for the production of scholarship, kits, and the way to manage bureaucracies. Of course, depending on your position in this scenario, the one editing the journal or managing an organization, on the one side of the equation, or the one who has to complete the draft, work, form, or bureaucratic memo due by some unreasonable deadline, on the other end, you may understand "Zeno's Badger" from the perspective of one of these, perhaps mutually exclusive or paradoxical, perspectives: a pointed criticism of academia's, and IT's, demand for spectacular displays of productivity and robotic control systems; a "perform-or-else" demand for your tech-serfs and adjunct faculty; an absurd way to shutdown the network systems: a scheme and book that provocatively highlights the out of control demands made by the half-baked algorithmic schemes that increasingly ru(i)n our lives; as a challenge to produce your own sociopoetic half-baked organizational schemes and intimate bureaucracies: an allegorical reading of a sea-glass-making hand-shake. In that last perspective, this book was a gift from Bill Tomlinson — a gift as hand-shake to agree to hand-make in order to hand it off to you, dear reader.